Allergy Advice: Contains Wheat, Coconut, Egg. Ingredients: Wheat Flour, Coconut Oil, Water, Salt, Egg Powder, Food Colour (FD&C Yellow #5 (E102), FD&C Yellow #6 (E110)). 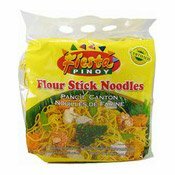 Simply enter your details below and we will send you an e-mail when “Flour Stick Noodles (Pancit Canton) (菲律賓中式炒麵)” is back in stock!